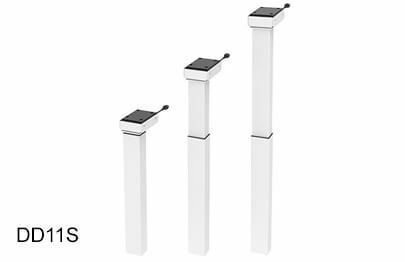 News from the Office division: Our new DD11S and DD21S lifting columns are now available and can be ordered as samples. The DD11S and DD21S are ideal drive solutions to apply in stable desks, which do not have crossbeams in their legroom. With their high level lifting force and stunning stability these actuator types meet and exceed the demanding requirements of the Pendulum Impact Test according to DIN FB147. Both models feature whisper-quiet operations because of their special gearing. The modern design of the individual profiles – without any visible functional openings – reveals only minimal differences. This provides furniture manufacturers with more liberty as they design their desks. 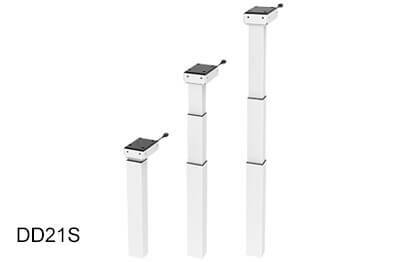 The lifting column systems differentiate in their stroke length, installation length, and column type. While the DD11S has a two-piece, single-telescoping steel column, the DD21S has a three-piece, double-telescoping column. The stroke length of the DD21S is 650 mm longer than the 500 mm of the DD11S. The installation length of 565 mm is, however, less (the DD11S requires 645 mm).